Get cool T-Shirts from Threadless! First Cones of the Season! 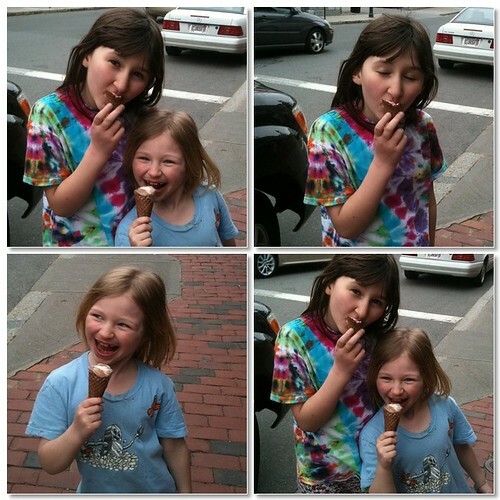 Today the weather has been in the 60s, so the girls and I took a lovely walk down to our local ice cream shop to get some ice cream. We were lucky, some friends were going there too, and there was a wonderful crowd of kids from LG’s school there! We have been so lucky to build a relationship with the owner of Coffey Ice Cream – she stocks gluten-free ice cream cones for us and a few other patrons! Plus, it always feels good to patronize a locally owned store rather than a chain! About Me: I'm a Mom living a busy life with 3 girls (11, 9, 6) who have just started school for the first time, Celiac Disease, , Chronic Lyme Disease which acts like Fibromyalgia, job-hunting, 1 cat, 1 puppy in exile, and a lot of books as we stay with family in New England. We eat great, homecooked, allergy safe food due to our food allergies & sensitivities. Our Gaggle of Websites is now hosted by the great folks at Steadfast Networks. We highly recommend them for multiple blog hosting! Book and product reviews are on hold until the New Year. The book I am writing, The Complete Idiot's Guide to Dairy Free Eating, will be finished on 12/15/08, so reviews will resume after the holiday season.